1. Ir﻿on interfacing on the back of your exterior and lining pieces. 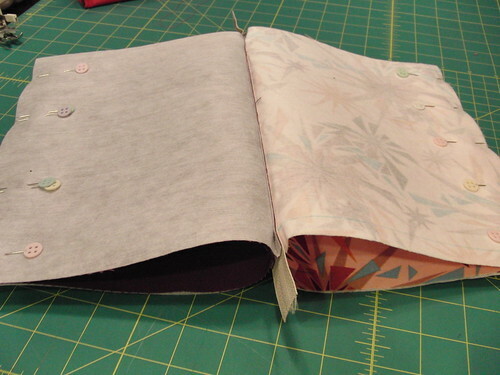 All four pieces should have interfacing because it's what supports the boxy shape of the pouch. 2. 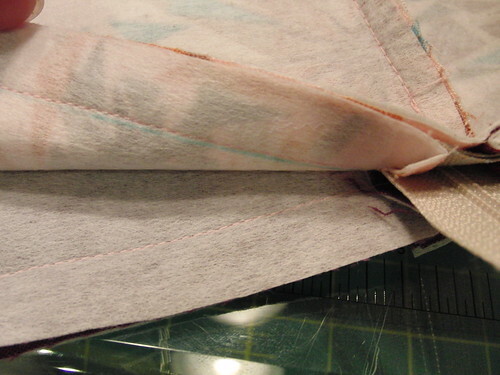 On the front and back of the exterior fabric, draw a line with a water-soluble pen 1/2" away from the edge of the fabric. Do this for the left and right sides (but not the top or bottom). 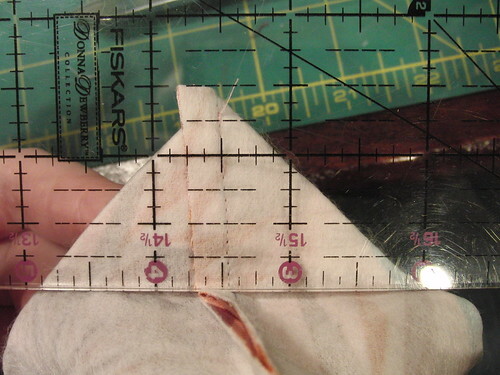 This line will show you where to stop and start your stitches when you start sewing. 3. Layer as follows: 1 lining panel - right side up, zipper - right side up (center it over the lining panel), exterior panel - wrong side up. 4. 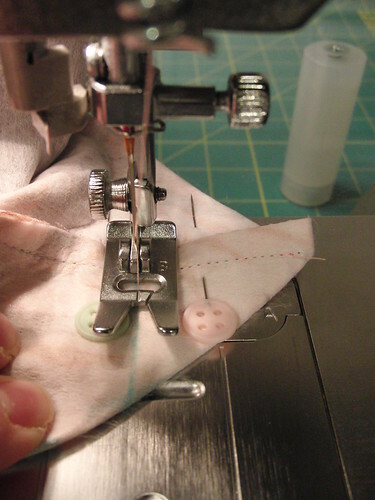 Using your zipper foot, sew layers together about 1/8" away from the teeth of the zipper. Stop and start on the 1/2" marks. This is important! If you go over this line even by a little bit, rip those renegade stitches out! 5. 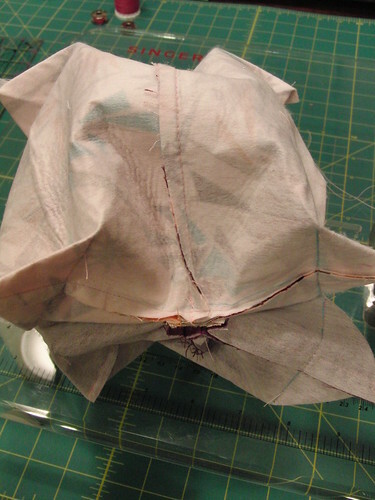 Fold the lining and exterior panels back and iron the seam. 6. Topstitch about 1/8" from the edge, stopping and starting on the 1/2" mark you made in Step #2. 7. Repeat Steps #3-6 for the other side. 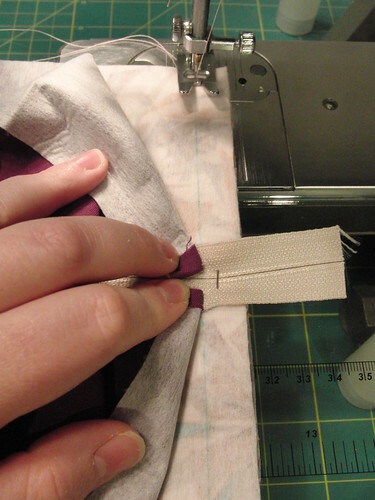 You will order the fabric the exact same way as in Step #3 (see picture below). 8. 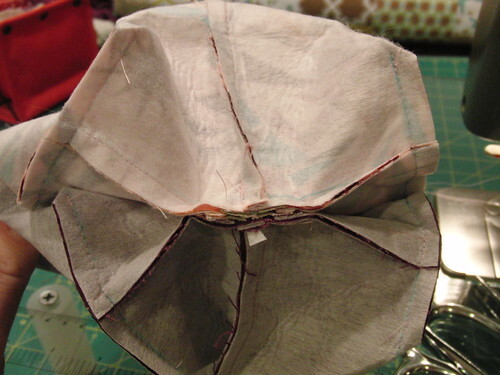 Once you've topstitched the other side, fold the lining and exteriors panels right sides together. The two lining panels will be facing eachother and the two exterior panels will be facing eachother. Pin along the bottom side only and sew a 1/4" seam from end to end of the exterior panel (you can ignore the 1/2" lines this time). Do the same for the lining panels, except leave about a 2 1/2" opening in the center. 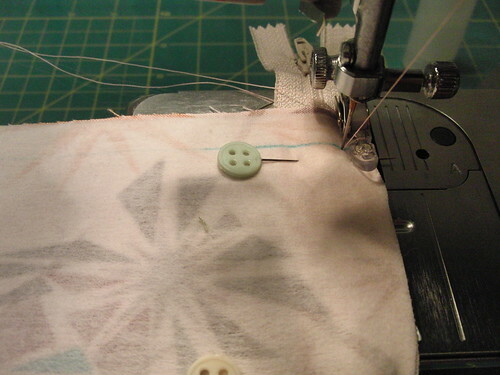 I like to double pin at the beginning and end of the opening so I know where to stop and start sewing. You have to have this opening in order to turn the bag right-side-out at the end. 9. 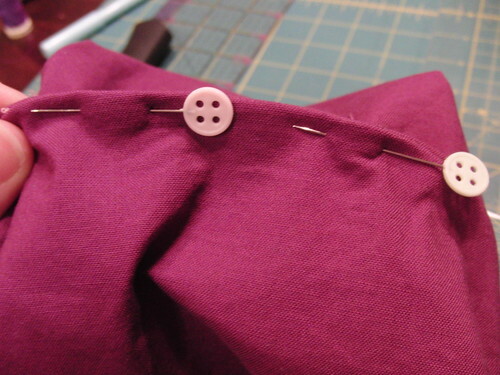 Pull the lining panels out so that the bottom seam you just sewed is centered over the zipper. Finger press the edges so it lays flat. 10. Repeat for the exterior panels, and then iron all the folds in place so the bag lays nice and flat. 11. Now here's the tricky part. 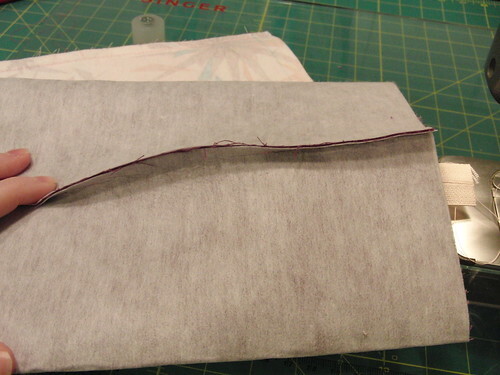 On the side of the zipper without the pull, fold one piece of twill/linen tape in half and pin it so that it's centered over the zipper (the looped end will be facing in) and the ends of the linen tape are lined up exactly with the raw edge of the fabric. When you pin the linen tape, be sure not to catch any of the lining. 12. 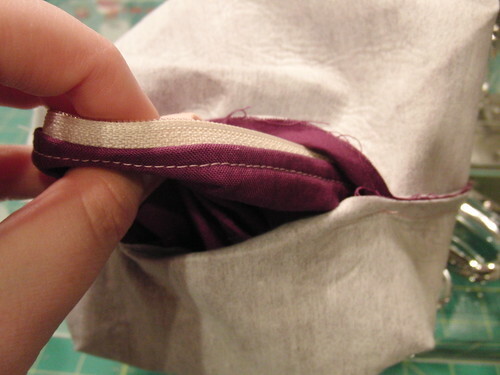 Flip the bag over, pull the lining up and away from the exterior panels, and sew a 1/2" seam. 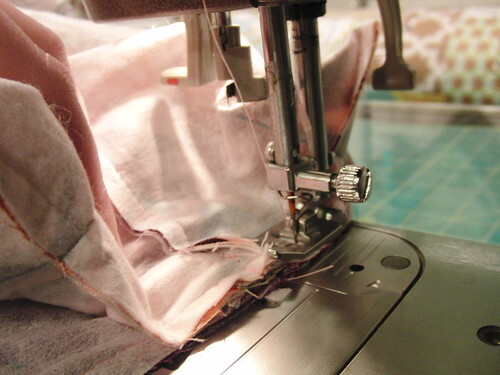 Be careful not to catch any of the lining fabric in your seam, because if you do, it will be difficult to make your boxy corners at the end. 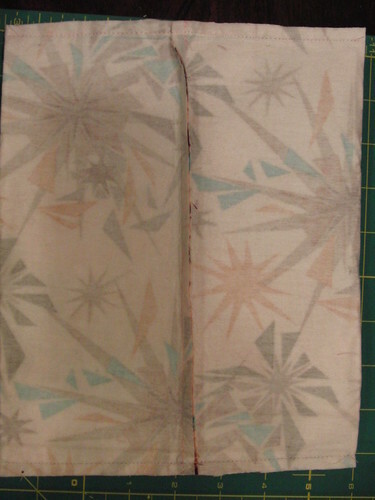 Flip the pouch over and repeat for the lining, pulling the exterior fabric up and out of the way so that the seams remain separate. 14. 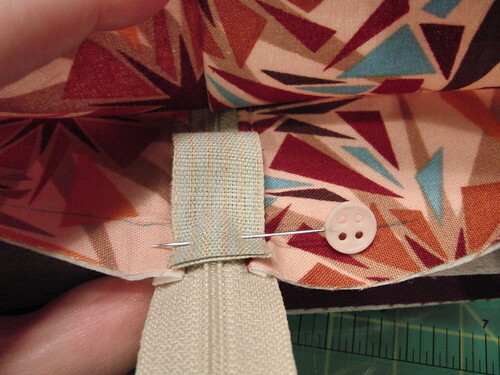 When you're finished, the seams should look like the picture below. The lining and exterior panels will be completely separate from eachother. You have to be able to pull them apart because of the way the boxy corners are done. 16. Pull one of the corners out as demonstrated below. 17. Measure 1 1/2" inches down from the tip, and 3" across. Draw a line with your marker using the bottom of the ruler as your guide. 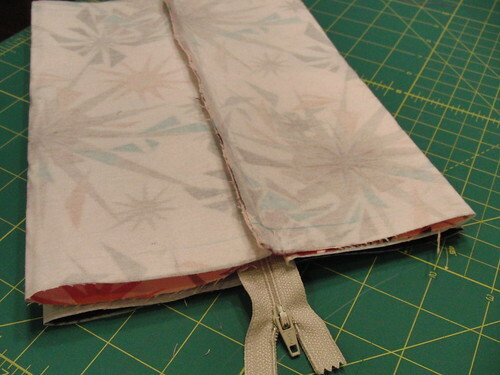 Make sure the line is straight, or else the corner seams of your finished pouch will be diagonal instead of straight up and down. 18. 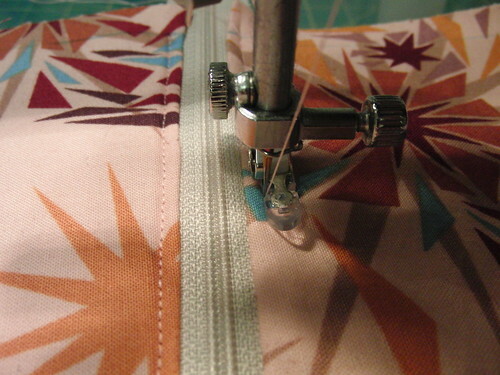 Pin the corner in place and sew directly over the line you drew. It can take some wrangling, but make sure the fabric is lying completely flat (esp on the bottom side). 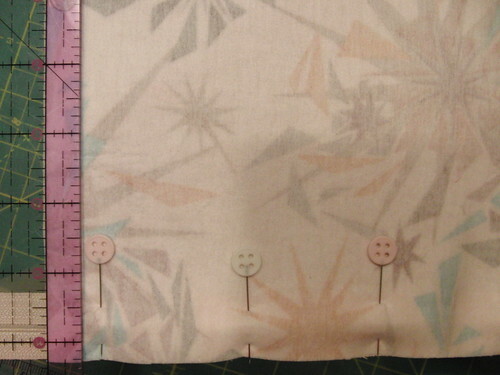 If the fabric is bunched up and you sew over it, your corner fabric will be pinched on the outside and it doesn't look very nice! Repeat Steps #17-18 for the remaining 7 corners. 19. 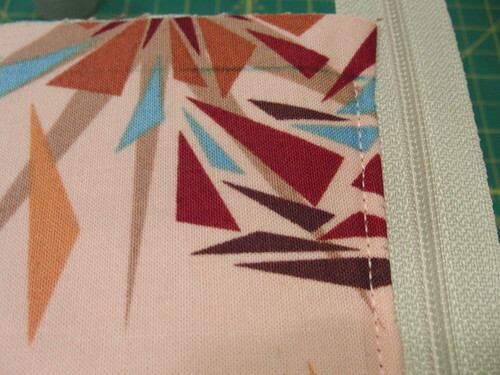 Once you've sewn all 8 corners, trim down to 1/4" seam. I wait until the end to trim all my corners, because if I discover I've messed up somewhere along the way, I can rip out the seam and fix it. 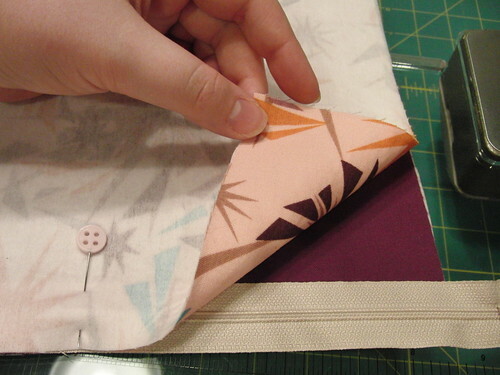 But once you cut those corners off, there's no going back and you'll have a rather odd-shaped hole in your fabric! Once you trim the corners, your bag should slightly resemble Kirby..haha! 20. This is the last step before you'll turn your bag right-side-out. 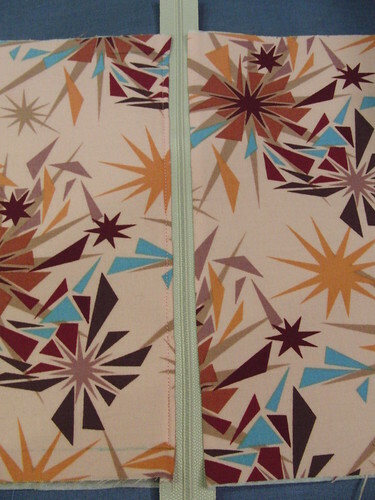 You need to sew the lining and exterior together at the zipper. 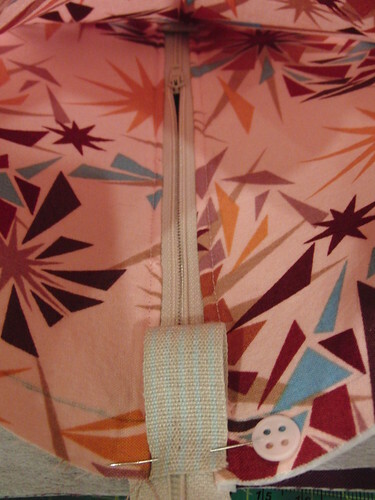 Otherwise there will be a small opening at the base of your zipper on each side. 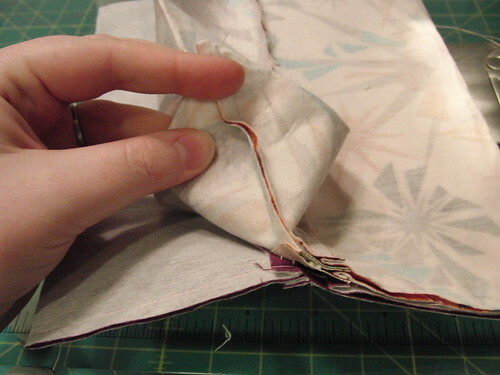 Find your side seams again and smash the corners down a little to make the seam lie as flat as possible. 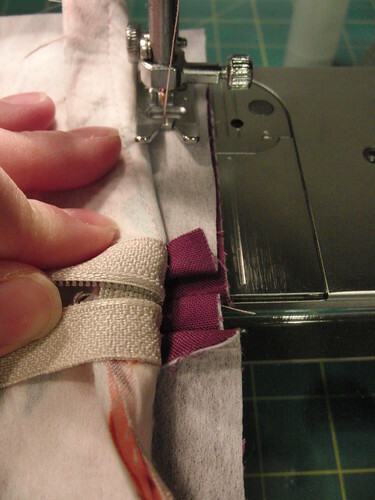 Start your seam about 1/4" above the zipper and end it 1/4" below the zipper. 22. Find the opening in the lining and pull the bag right-side-out. 23. Once you're finished with the opening, tuck the lining down into the bag and poke all the lining and exterior corners out with your fingers. Congratulations! You've made a box pouch! 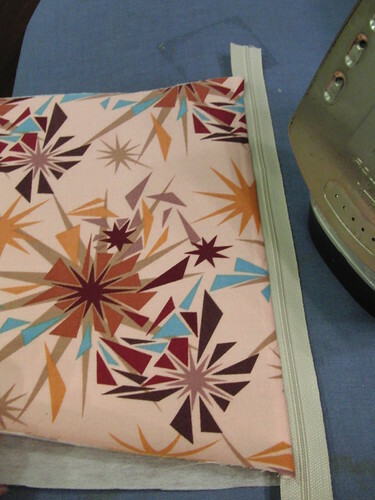 If you'd like to keep the lining clean, use some iron-on vinyl on the lining pieces before you start your project. This is especially good if you're going to be using it as a make-up bag. 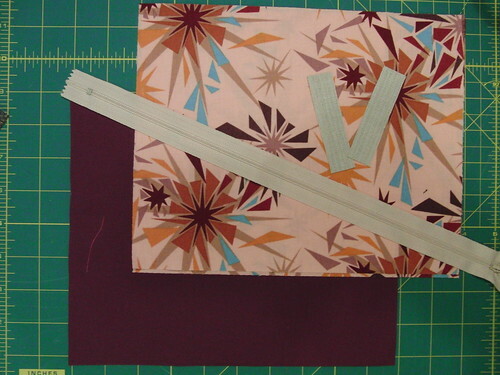 If you'd like to make a purse-friendly size pouch, cut your lining and exterior panels to be 8 x 7, and use a 9" instead of a 12" zipper. Follow the tutorial directions with one change. When you get to the part with the corners, measure 1.25" down from the corner, 2.5" across, and mark. 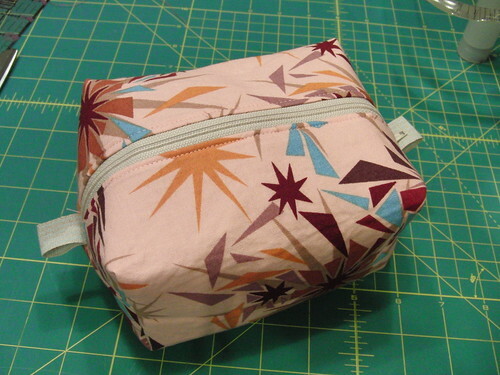 If you'd like to make a boxy pencil case, cut your lining and exterior pieces to be 10.5" x 3.5". Follow the tutorial directions with one change. When you get to the part with the corners, measure 0.75" down from the corner, 1.5" across, and mark. this is so great! :) thank you for the tutorial! Thank you so much for the tutorial; it looks great1 I can't wait to try it out! this is a great tutorial Kaelin! I'll have to direct people over to it. Your pictures are so clear for each step...having made one before I can say in complete confidence. 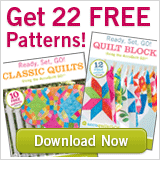 I'm looking forward to getting off and trying this pattern TONIGHT! I have been very unsuccessful in my attempts to make these, but your instructions seem very clear and easy to follow. Thank you for posting this! @ohsoswt79 - yay! let me know how it goes and i wanna see pictures! Congratulation on a well written and illustrated tutorial! I've seen something similar,but not with the nice separate lining yours has. Good suggestion about the vinyl lining and thank you for including the extra dimensions fro the other uses. i just made one! this tutorial was great, and very easy to follow!! thanks so much. 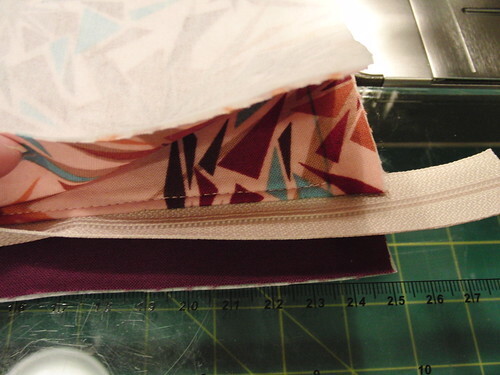 I save my corner cut offs and keep them in a box pouch (purple, of course) next to my sewing machine to use as sewing leaders. Great tutorial! Love your blog and have just signed up as your newest follower! Thank you for this great tutorial. Now i finally can try to make one. I bookmarked this ages ago and finally got around to making one. Thanks for the clear instructions and photographs! Excellent, clear tutorial. I made the small, purse-sized box, and it is adorable. Thank you for taking the time to put this together. Your efforts are greatly appreciated. I have made one of these with another tuto, but I'll try yours now, thanks! Thank you so much for this tutorial ! I just stumbled across your blog and are impressed about your writing style - really neat. Can.t wait to do this box pouch. Indeed, choosing the better if not the best shoutcast server hosting provider is really crucial! Many what ifs and considerations must be considered. Your post is very useful to give us knowledge on the things that must be considered for choosing a shoutcast server hosting. This is magic!! I was a little dubious as I was sewing and couldn't see the outside to watch my progress, but when I turned it rightside out it was stunning! I'm making a second one today. Thank you! 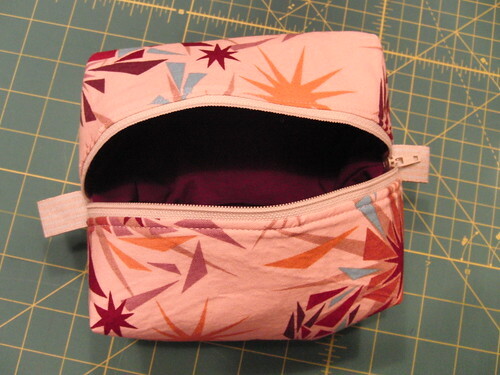 I have just finished my first boxy pouch, what a great tutorial. I'll definitely bookmark this page and recommend the tutorial on my blog. A very well-written tutorial, super comprehensible and easy to follow! Just sewed a toilet pouch for my mum's birthday. Thanks a lot for sharing. Thank you for the clearly written tutorial. Made three and intend to make few more. Making them for charity bazar. My favorite tutorial for this model. I love how nice the lining looks. The stage just before turning everything right-side-out is always a bit nervewrecking, but it always turns out fine! Thanks for your time and effort in making this tutorial.